For over 20+ years 4X's Best-Selling Author Joni Wilson has limited her unique, cutting-edge; 3-Dimensional Voice® Training to serious voice students and clients, especially those facing career-threatening voice problems and life-changing opportunities. Now, with this year's release of her 2 latest, best-selling books: The Voice of Success: A Woman's Guide To A Powerful And Persuasive Voice: Revised Female Edition, and, The Voice Of Success: Male Edition: Voice Tools For The Man Who Commands Attention, Joni decodes the mysteries of the human voice, both male and female. In an easy to understand, powerful voice method, Joni has put together a training package that is new, unique, and incredibly effective for all ages, genders, nationalities, and careers. Who Needs A 3-Dimensional Voice®? This one-of-a-kind Voice Training is for speakers, business professionals, online marketers, authors, entrepreneurs, media performers and everyone who needs a powerful, professional, long-lasting voice to deliver their unique message. 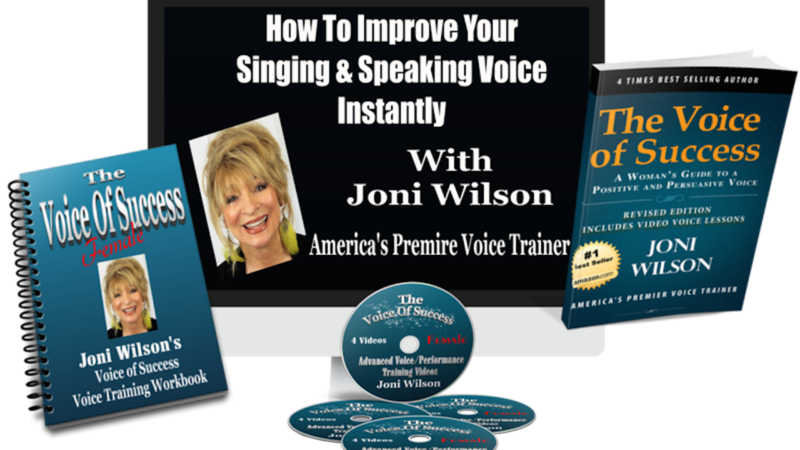 This training package contains four (4) FULL Video Voice Lesson downloads, four (4) MP3 audio downloads, one (1) 60+ page Voice Manual/Workbook, and a PDF copy of Joni's Best Selling #1 Voice of Success Female Edition. These items are all are available for instant download upon purchase. Joni shares information that will help you avoid years of expensive voice coaching and save you a lifetime of frustration and voice problems. Joni's clients call her a "Miracle-Worker" and are happy that she is, at last, sharing her unique voice method with a world that needs her expertise and help! "Can I add power to my voice without killing it?" YES! "Can I deepen my voice without tiring it?" YES! "Can I stop my voice from nervous shaking?" YES! "People say I mumble, can I learn to talk clearly?" YES! "Do we really all have 2-Diaphragms to power our voices?" YES! "Can I really conquer stage fright?" YES! Why Voice Training Just For Women? In today's competitive world we all want to be heard and acknowledged for our contributions. As women, we want others to perceive us as the intelligent and strong, capable, and professional people that we are; but even the most brilliant and skillfully articulated ideas can be sabotaged by a weak, annoying and grating voice. Today; when "ALL THE WORLD REALLY IS YOUR STAGE", to get your point across, it's essential to have a pleasant, yet strong voice that will get others to hear what you have to say.